Just a short walk from West Campus, Urban Renewals in Allston is a sprawling space packed with tons of clothes. They have an enormous selection and a huge range of sizes. Both men’s and women’s pants, shirts and jackets fill row after row. The best part is everything is priced to sell quickly, with most items in the $3 to $10 price range. You’re actually not allowed to try anything on, but they claim that is how they keep their prices so low. Either way, head down to Allston to pick through their huge selection and find some gems. Boomerangs is a local family of thrift stores with locations in Jamaica Plain, West Roxbury, the South End, and Central Square. The stores are operated by the AIDS Action Committee of Massachusetts with all proceeds directly supporting their mission. They sell a wide variety of new, used, and vintage clothes and accessories. This store feels like a great balance between price and quality. 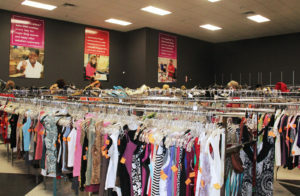 While you may pay a bit more here than other larger national thrift chains, the selection often includes some higher quality items and you know your money is going to a great cause. Bobby from Boston, located in the South End, is a legendary establishment in certain crowds across the city. Their selection of vintage clothing for both men and women is unmatched anywhere else in Boston. Each piece in the store is carefully curated to match the style and feel that customers have come to expect from Bobby’s. Simply strolling through this store and its selection is an experience. Although the prices might be high, you get exactly what you pay for. Every garment and accessory at Bobby’s shows off the quality that you simply cannot find in clothes these days. This is one of the most well-known spots in the Boston area for thrifting, vintage clothing and costumes. The sprawling 12,000-square-foot space, located just off of Kendall Square in Cambridge, is filled with a huge selection of clothes for both men and women. They run frequent specials where you can grab some great items for extremely low prices. The Garment District also stocks tons of great costumes and items specifically for the Halloween season. In fact, for the whole month of October, they are open until midnight every night so you have plenty of time to put together your best costume yet. You’ll likely find just about anything but clothes at this Somerville spot. Odds and Ends Thrift Shop, located in Union Square, sells pretty much anything: furniture of all kinds, records, tools, picture frames, instruments and even old arcade machines. While you might not find the perfect robe to complete your costume, you may find some great decorations for your dorm.